The visiting Dodgers send RHP Walker Buehler (6-5, 3.09 ERA) to the hill to face RHP Jack Flaherty (8-6, 2.92 ERA) of the Cards. Buehler lost his last start, giving up four runs in six innings to the Rockies. He went seven innings and gave up just three hits to St. Louis back on August 22 in a game the Dodgers lost thanks to the surrender of two ninth-inning home runs by the bullpen. The starter for the Cardinals in that game was this same Flaherty, who went six innings and gave up just one hit, a home run by Joc Pederson. He had five quality starts in August but hasn’t gotten out of the sixth inning in either of his September starts. 1951 Preacher Roe wins his 20th game of the season when the Dodgers beat the Pirates at Forbes Field, 3-1. The 36 year-old southpaw will finish the season with a 22-3 record. 2002	Chin-Feng Chen becomes the first Taiwan-born player to appear in the major leagues as he walks and scores as a pinch-hitter for the Dodgers against the Rockies. The 24 year-old first baseman-outfielder played for the 1990 Taiwan team which won the Little League World Series. 2008 Mets shortstop Jose Reyes, with his eighth-inning thievery in a 7-4 loss to the Braves at Shea Stadium, becomes the first player to have four straight seasons of 50 or more stolen bases playing for a New York area team, which also includes Yankees, Dodgers, and Giants. The accomplishment extends the infielder’s own record, as he is also the only Gotham major leaguer to achieve the feat for three consecutive years. Also, in 1990	Mariner Ken Griffey and his son, Junior, become the first father and son to hit homers in the same major league game. The back-to-back blasts are given up by Angel hurler Kirk McCaskill. It’s very hard to believe, but this is the first meeting of these two teams this season. The Dodgers’ LHP Alex Wood (7-6, 3.51 ERA) takes the hill to face the Card’s rookie LHP Austin Gomber (3-0, 2.89 ERA). Wood has given up no more than three earned runs in any of his last 11 starts, and he likes it at Dodger Stadium: he’s 17-7 with a 2.76 ERA there. Gomber is newly promoted from the bullpen; his first big league start was on July 24. His last three appearances in August have been starts. He shut out the Nationals in his last start, going six innings while giving up only three hits and striking out six. 1945 Dodger shortstop Tommy Brown becomes the youngest player (17 years, 8 months, and 14 days) in major league history to hit a home run. The round-tripper by ‘Buckshot’, who started his career as a 16 year-old high school student, will be the only run Brooklyn scores off 30 year-old Pirates southpaw Preacher Roe, who goes the distance in the 11-1 rout of the home team at Ebbets Field. 1974 In an 18-8 rout of the Cubs, the Dodgers collect 24 hits and set a club record with 48 total bases, including Davey Lopes’ three home runs, double, and single. The Dodger second baseman’s 15 total bases are the most ever for a leadoff hitter. 1978 In the visitors’ clubhouse at Shea Stadium, Dodger Blue becomes black and blue when Steve Garvey confronts teammate Don Sutton about a Washington Post story in which the pitcher is critical of him. After the right-hander confirms he had made the comments, the argument becomes physical when an inappropriate remark is made about the first baseman’s wife. Humph! MLB’s latest power rankings have the Cardinals climbing from #14 to #8 and the Dodgers sliding from #6 to #11. Here’s the backstory behind Caleb Ferguson’s rise from The Athletic. The Astros try to sweep this series with RHP Gerrit Cole (10-3, 2.55 ERA) taking the mound against the Dodgers’ RHP Walker Buehler (4-4, 3.65 ERA). The last time Cole pitched in Dodger Stadium was August of 2016; he was a Pirate then. He had an excellent June but a so-so July. Buehler spent time on the DL with a microfractured rib (is that what we used to call a cracked rib?) and hadn’t had a really good outing since he came back until his last start on July 31, when he went seven innings, gave up one earned run, struck out seven and walked none. He still got the loss as the Dodgers couldn’t score a single run in that game against the Brewers. 1954 Stan Musial, in a 13-4 rout of the Dodgers in Brooklyn, paces the Cardinals attack, hitting two homers and driving in seven runs. The defeat is Preacher Roe’s first loss to St. Louis at Ebbets Field in four years. 1969 With a titanic blast that clears the right-field pavilion, Willie Stargell becomes the first player to hit a home run completely out of Dodger Stadium. The 506-foot round-tripper helps the Pirates defeat LA, 11-3. 1979 Don Sutton, surpassing Don Drysdale, becomes the Dodgers’ all-time strikeout leader with 2,487 when he fans six in an 8-1 victory over San Francisco at Chavez Ravine. After establishing the mark, and receiving a two-minute standing ovation that he acknowledges by tipping his cap, the right-hander is charged with an automatic ball due to running his fingers across his lips while thanking the crowd. 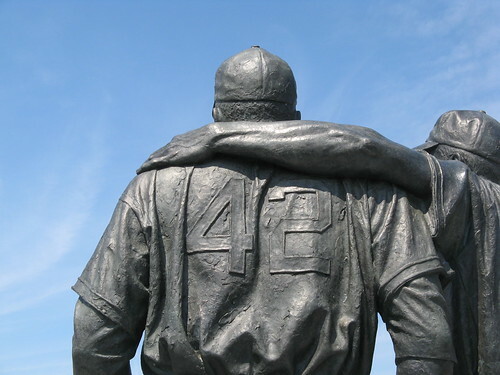 1979	Outfielders Willie Mays (Giants, Mets) and Hack Wilson (Giants, Cubs, Dodgers, and Phillies) are enshrined into the Hall of Fame. Baseball administrator Warren Giles, who served as the president of the National League from 1951 to 1969, is also inducted during the Cooperstown ceremony. With all the interchangeable parts Dave Roberts has and uses, I’m thinking of calling him Casey Stengel II. RHP Ross Stripling (6-2, 2.27 ERA) goes for the Dodgers against the Angels’ RHP Deck McGuire (0-1, 7.56 ERA), who’ll be making his second big league start. His first didn’t go well: last Sunday he gave up five runs in 3 1/3 innings to the Orioles. Stripling himself hasn’t won in his last four starts. Maeda to paternity list, RHP Dylan Floro called up. 1953	The Dodgers set a major league mark for the most consecutive games with a home run by a team with a least one round-tripper in their 24 contests. Brooklyn starter Preacher Roe hits the record-breaking homer with a third-inning blast in the team’s 9-5 victory over Pittsburgh at Forbes Field. 1998 Jeff Shaw becomes the first player to participate in an All-Star Game wearing a uniform for a team he hasn’t yet played for when he works an inning, allowing three hits and a run pitching for the National League squad before appearing in a regular season game for the Dodgers. The 32 year-old closer, who posted a 1.81 ERA along with 23 saves in the first half of the season for the Reds, was traded three days ago by Cincinnati to Los Angeles for Paul Konerko and Dennys Reyes. 2004 Kazuhisa Ishii tosses a one-hitter in the Dodgers’ 11-0 defeat of Arizona. The 30 year-old Japanese southpaw retires the first 12 batters he faces before issuing a leadoff walk to Luis Gonzalez, which is followed with a single by Shea Hillenbrand, but then the left-hander proceeds to mow down 15 consecutive D-Backs to finish his masterpiece. The Reds send RHP Luis Castillo (2-4, 6.47 ERA) to try to complete a four-game sweep of the Dodgers, who will counter with Rich Hill, (1-1, 7.11 ERA). Castillo’s last two starts have been his best of the season; he gave up only four runs in 11 2/3 innings against the Mets and Brewers. Hill’s last outing was bad; he gave up seven hits and five runs in only four innings. 1947	During the pregame infield practice, a barrage of racial slurs is directed at Jackie Robinson by the Cincinnati fans during the Dodgers’ first visit to Crosley Field this season. Brooklyn shortstop Pee Wee Reese, captain of the team and a Southerner from Kentucky with friends attending the game, engages the black infielder in conversation, and then put his arm around his teammate’s shoulder, a gesture that stuns and silences the crowd. 2013 Thanks to a seventh-grade history class project, a three-mile stretch of the Kansas K-79 highway, from K-16 highway to Circleville, is designated by the Kansas legislature as the Barnes Brothers Memorial Highway in honor of Ozzie and Virgil, who grew up in the community and played with the Braves, Giants, and Dodgers in the 1910-20s. The McAlister middle schoolers’ research brought to light the many major league accomplishments of the two siblings, including being participants in first brother matchup in big league history. The visiting Dodgers try to finish a sweep of the Tigers in a day game from Comerica Park. They’ll send RHP Kenta Maeda (11-4, 3.76 ERA) to the mound to face 2011 Cy Young Award winner RHP Justin Verlander (8-8, 4.11 ERA). Maeda is on a hot streak. He’s gone 5-0 with a 1.95 ERA in his last six starts. He’s never faced the Tigers. Verlander gave up three HRs in a loss to the Rangers on Tuesday. He’s certainly not having a year even close to his standards. Potential milestones: Verlander is looking for his 30th interleague win. He’s gone a gaudy 29-5 with a 2.94 ERA in 41 career regular-season starts against National League teams, but he hasn’t victimized the Dodgers much. His only start against the Dodgers was a home victory on July 8, 2014. Adrian González needs two hits to reach 2,000 for his career, but Verlander’s not the guy he’d like to face to get there. He’s 3-17 lifetime against the Tigers’ pitcher. I remember lying on a couch in my relative’s home while on vacation in Santa Maria listening to Scully and Doggett tell me about this one: in 1961 in the second game of a doubleheader the Phillies snap a 23-game losing streak by beating the Braves, 7-4. The victory establishes a new record for the most consecutive losses by a major league team. The Dodgers send July’s NL Pitcher of the Month Rich Hill (8-4, 3.35 ERA) to the mound to face RHP Seth Lugo (5-3, 4.53 ERA). Hill has allowed two or fewer earned runs in 12 of his 15 starts, and he went 4-0 with a 1.45 ERA in July. Lugo was 2-2 with a 5.29 ERA in July. He’s gone 3-0 against NL West teams this year, albeit with a rather unsightly 4.91 ERA.